Part of the Smith Brothers Services, LLC family of Meyer Plow web sites! This was the module originally used with the E-88 Xpress Plow. It only used one Module. These modules are pretty simple in how they work. There are inputs, and outputs. The 07116 Type 1 had internal fuses that were potted in epoxy, and not serviceable. There is no point in trying to diagnose them, because they are obsolete. You will have to buy the current 07347. Most problems attributed to the Modules are actually a wiring problem with the inputs from the vehicle wiring. The 07347 Type 2 Module was designed when vehicle manufacturers started really monitoring amp draw on their electrical systems. This was around 2007. The Red input to the B Socket is power to feed the plow turn signal. It does not feed anything else. This was to stop the "Lamp Out" light from illuminating on the dash of vehicles that were monitoring amp draw of the lights. The newer the vehicle, the more sensitive the BCM (Body Control Module) is to additional loads on the vehicle electrical system. They often monitor milliamps. Like the 07116, the 07347 was also potted in epoxy, with internal fuses and was not serviceable. The original 07347 is also obsolete. Once again, there is little point in troubleshooting them because you will be buying a new 07347 with replaceable fuses that is serviceable as far as replacing the fuses. We will get to the fuses later. The A Harness routes the wires that feed the vehicle headlight bulb, through the module, and back out to the vehicle headlight. Power just passes right through, unless power is supplied to the B Socket Orange wire. The Orange wire energizes an internal relay, that then sends the power out to the plow headlight using the internal relay (instead of letting it pass through out to the vehicle headlight). It just routes the power out to the plow light. Very simple. As far as the wires go, there is a Low Beam, High Beam, and Common, because some vehicles have a positive ground headlight system. So the common wire is not always supplying ground like you would expect. On positive ground headlight systems, the common wire supplies power, not ground. The headlight switch in the vehicle sends ground out to turn on the lights. This is why the plow lights also have a ground wire that is for the turn signals and marker lights, which are NOT positive ground. The B Harness is an input harness, as it shows in the diagram above. The Red wire supplies battery power to the plow light turn signal (via an internal relay). The Orange wire supplies power from the switch in the cab to energize the relay that sends the headlight power out to the plow light instead of the vehicle headlights. The Green wire is fed from the vehicle turn signal. It is the trigger for another internal relay inside the module that supplies power to the plow light turn signal directly from the battery (which is where the other end of the Red wire is connected, with a 5 amp inline fuse). The Yellow wire is fed from the vehicle parking lights. It just passes through the module and out the C Harness to the plow light, much like trailer lights do. IF these fuses are blown, there is a short somewhere or damage to the C Harness, or a poor connection. It could be anywhere between the Module and the plow lights, and even inside the plow light. It could also be in one of the many plugs (connectors) on its way out to the plow light. Even with the triple lip silicone seal on the connectors, we see A LOT of green corrosion on the pins in these connectors because the installer did not apply dielectric grease to the connections when the plow was assembled and installed. I even coat the silicone seals with dielectric grease during installs to help prevent moisture from getting in. Some of the connectors are in bad places to have to get to for service, so you better do it right the first time! When replacing the 07116 with the 07347 you will need a new B Harness. You will have to run the Red wire on the new B Harness to the vehicle battery. I can't speak for other dealers and distributors, but in our shop and our online store, it is a better deal to buy the 07548 Headlight Module Kit. It includes two 07347 Modules, two new B Harnesses, and two new C Harnesses. IF you had a 07116 Module go bad, you want to start fresh with new wiring as well, but that is just my opinion. It will help eliminate the cause of the module failure at the same time. So here is the October 2017 update. Meyer has been busy designing new Modules to interface (work) with new trucks. We have the 07776 "Soft Start" green Modules now. There are also several versions of this one. Some of the Headlight Adapters are now including the Modules. 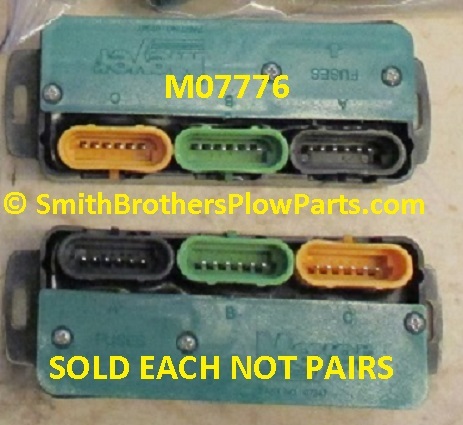 These 07776 Meyer Headlight Modules are currently being used with Chevrolet / GMC and Dodge vehicles, however, there are more of them for Ford trucks (ONLY) now too (07814). 07347 Genuine Meyer Type 2 Headlight Module. SOLD EACH. Will not replace the older 07116 Module without a new B Harness that is NOT included. This is just a single 07347 Module, NOTHING else. Fits 07347 Headlight Modules. Plugs into B port on Module. Has Black, Green, Yellow, Orange, and Red wires. Will NOT FIT 07116 Module. Red wire has inline fuse. Additional photo of Module to show B Port. MODULE NOT INCLUDED. 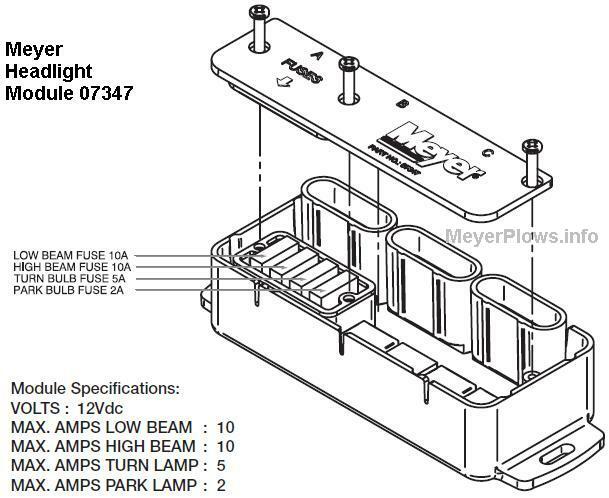 Genuine Meyer Nite Saber Headlight Module Kit Meyer Part# 07548. Includes the NEW STYLE 07347 modules that have replaceable fuses! Meyer Nite Saber Headlight Adapters - Which one do you need?